Summary: PNNL researchers are advancing science that will result in lower cost and improved lifespan for electric vehicle batteries, more efficient lighting, sustainable buildings, and a reliable power grid, among other things, said Director Steven Ashby as a keynote speaker at the CleanTech Showcase 2016. View Steve's entire presentation for more information. 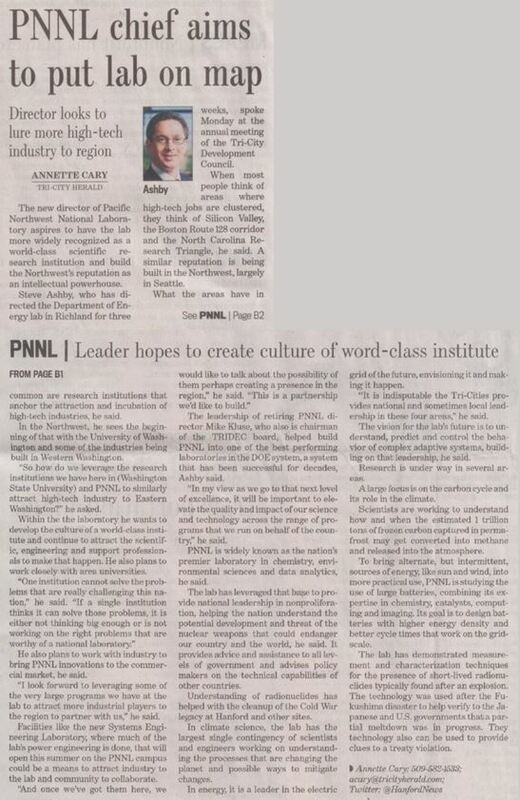 Summary: PNNL aspires to become widely recognized as a world-class scientific research institution and to strengthen the Northwest's reputation as an intellectual powerhouse, said Laboratory Director Steven Ashby. Download to view Steve's entire presentation. You also can read an article published in the Tri-City Herald that covers the speech. View Steve's live presentation, which begins at the 18-minute mark in the timecode.